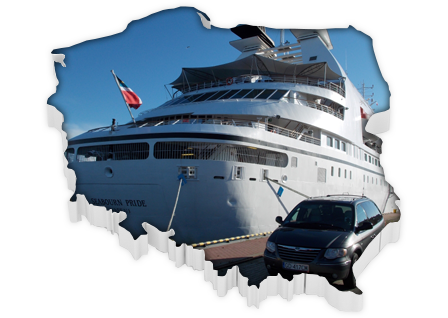 Trip2Gdansk is a Gdansk-based company established by professional tour guides and transport experts with a long first hand experience in the travel trade. Our Company is known for being a serious provider for shore excursions and city sightseeing tours at a reasonable price, with great flexibility in routes and vehicles of all sizes to cover the needs of our travellers. Our prices are one of the best on the market with well-balanced itineraries to visit the most important highlights in each destination . We offer also the possibility to adjust the itinerary to suit the group and their special requirements and wishes. All our prices include certified guides with or without transportation and do not include entrance fees unless the tour description informs of any entrance included on the global price of service. * Private Shore Excursions guarantee you to travel with your family or friends alone and, to fully customize your tour at most competetive prices!. * Standard Shore Excursions typically range from 20-50 people. These tours are similar only in size to those offered by most of the cruise lines. All shore excursions are customized to the needs and expectations of a given group..
by the Kingdom of Prussia, to be devastated in the years after. At the beginning of 19th century, after protests of the German society the castle’s demolition has been stopped in 1803 and since 1817 until ca.1940, the Malbork castle has been constantly reconstructed, under the guidance of several important German architects, with the best work done by the team of the historian Konrad Steibrecht . It is an interesting example of military architecture , expanded several times to host the growing number of Knights, and made the largest fortified Gothic building in Europe. It features three separate sections – the High, Middle and Lower Castles, surrounded with thick walls and separated by multiple dry moats and towers It once housed approx. 3000 „brothers in arms”, and the outermost castle walls enclose 52 acres, four times larger than the enclosed space of Windsor Castle. Both castle exterior and interior are just fascinating. Interior courtyards, gates, dry moats, wells, castle treasury, reconstructed mill and much, much more to see. 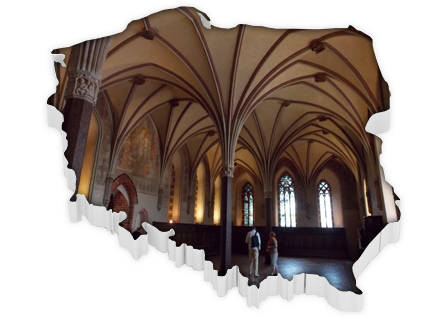 The dormitory, dining rooms, kitchen, castle treasury, Malbork’s armory – you need at least 2 hours to catch the spirit and take some pictures. Drive to Malbork. On the way to the castle you will see the remnants of villages, dams and architecture made by Mennonites. we suggest to have lunch break there. 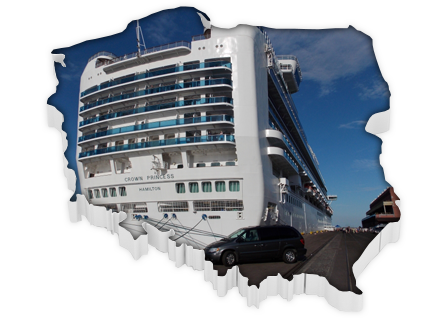 Return to Gdansk /Gdynia or another fixed point. landscape with sweeping willows implanted along the dikes. Learn about hard daily life of farmers working their land with draft horses, large dairy farms , cheese production . You will stop to visit the unique Mennonite Museum in Nowy Dwor Gdanski and try local meals at Cedry Wielkie. Duration: 8 hours Prices upon request. 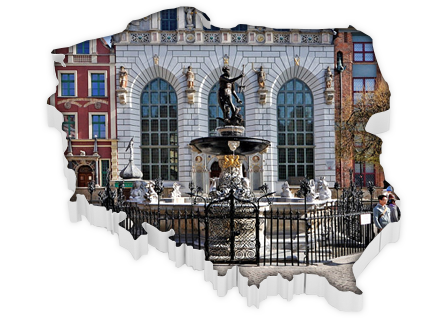 During this tour you will get acquainted with the history and culture of one of the countries in the former Soviet block, learn the history of the social reforms and revolution in Poland and understand why everything began right here in Gdansk. You will see the places where Lech Walesa jumped over the gate to join the shipyard workers on strike, has his Office in Gdansk, fragments of the historical Berlin Wall, visit interesting exhibitions, and much much more! If you want to feel the atmosphere of communism in Poland, learn about the unforgettable August 1980 that resulted in the free workers union – solidarity and time of martial law in Poland, come and see the highly interesting museum The Roads to Freedom! The tour usuallly starts from SOLIDARITY SQUARE, located close to former GDANSK SHIPYARD, where Lech Walesa appeared to the world. The site of the now privatised Gdansk shipyards (the birthplace of Poland’s historic Solidarity movement) will be soon developed into a complex of shops, movie theaters, hotels, office buildings, and residential property. The multimillion dollar complex has been named „Young City, ” and will include a European Solidarity Center. Next point includes a visit to the GATE OF FREEDOM and ROADS TO FREEDOM exhibitions where you can feel the atmosphere of communism in Poland, the unforgettable August 1980 that ended up with the free workers union – solidarity and time of martial law in Poland. There are lots of other places which evoke memories of those times. You will also learn about the round-table negotiations, about Lech Walesa, famous Gdańsk citizen, about his Presidency, his sense of humour and current activities. Kashubian Switzerland is a region which abounds in woods, lakes and picturesque moraine hills. A full-day trip to this area is undoubtedly an additional attraction you should not miss while visiting the Tricity. Apart from the breathtaking views, the Kashubia Region boasts its strong traditions which are still cultivated, an interesting culture, a language which has only recently been discovered and delicious specialities of the Kashubian cuisine. Szymbark, where you will learn about a unique Kashubian notes , try snaff, learn to sing Kashubian songs, and also discover the longest wooden plank in the world, an “upside down”house , the Siberia Exile Home and the Canadian Traper House. At the end , do not forget to climb to the top of the observation point on the Wieżyca Hill (329m above the sea level), which is the highest point in the Middle Europe Plateau. The sunset admired from this place is worth climbing to the top of the observation tower.